Heat a large non-stick skillet to medium heat. Add 1 tablespoon of olive oil to pan. Next add pepper rings. Saute for 1 minute. 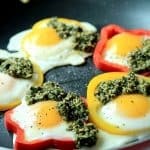 Crack one egg in each pepper ring, put cover on pan. Saute eggs for 2-3 minutes, for over easy.